We are pleased to announce that Lama Mark will be giving a two week Dzogchen Trekchö meditation and study retreat at the Dharma Centre of Canada. Dzogchen or Atiyoga—translated as Great Completeness or Great Perfection—refers to the highest of meditative yogas for realizing mind essence. It is the distillation of all experience, our primordial nature. It is ‘great’ (-chen) because it is beyond any concept, fixation or obstruction. All experience is already perfect (dzog-)—naturally empty of any taints or obstructions—it is utter purity. Dzogchen is spontaneous great compassion, a pervasive freedom that contacts countless beings. Through Dzogchen the luminous-empty, yet cognizant quality is discovered to be the meditation, the study, the reflection and activity. The retreat will start on the evening of October 11th with an empowerment and reading transmission of the meditations called Guru Namgyal; the three part yoga revealed by the Ven. Namgyal Rinpoche. The evening will finish with a community feast (Tsog). This will be a celebration of the anniversary and the life of the Ven. Namgyal Rinpoche, founder of the Dharma Centre of Canada. 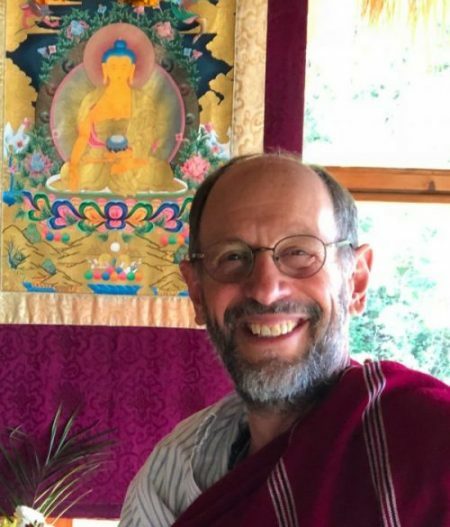 Lama Mark will also begin with teachings and meditations on the mind of enlightenment (bodhicitta), by commentaryon Lama Khunu’s 356 verses on bodhicitta. * An Empowerment of Chenrezig will then be given followed by a Phowa transmission, teachings and daily group practices. After an empowerment of Guru Rinpoche, the rest of the retreat will be the step by step exploration, commentary and meditations of Trekchö, the practice of ‘thoroughly cutting through’ the apparent solidity of experience. The text used will be Patrul Rinpoche’s 19th century commentary of the Hitting the Essence in Three Words of Garab Dorje, with additional explanations by Lho Ontül Rinpoche and the Ven. Namgyal Rinpoche. We will finish with a purification smoke offering. October 14th, 9:30am: An Empowerment of Avalokiteśvara (Chenresig) and reading transmission of Orgyen Nüden Dorje’s condensed Chenresig practice. 7:30pm: Evening group practice session. October 15th to 19th: Phowa Transmission, teachings and daily group practice sessions of Lho Nüden Dorje’s “The Ruby Garland” called the Swift Accomplishment of the Rainbow Body within One Week. An Indispensable Practice of Consciousness-Transference (Phowa). October 20th, 9:30am: Empowerment of Guru Rinpoche in the manifestation of Orgyen Kalden Drenze, a treasure revealed by Lho Nüden Dorje. 7:30pm: Evening reading transmission and group practice. October 21 to 23rd: Transmission and teachings on Garab Dorje’s “Hitting the Essence in Three Words” and Patrul Rinpoche’s commentary on that profound pith instruction and means of Trekchö Dzogchen practice. October 24th, early morning: Smoke Offering, called “The mountain purification and river purification into virtuous forces by means of Vajravidarana”, by Orgyen Lho Nüden Dorje. There will be opportunities for interviews with the teacher. To register, questions about food and accommodation, please contact: www.dharmacentre.org/register.html and or Toll-Free: 1.866.266.0966, Tel: 705.488.2704. Email info@dharmacentre.org Costs: By donation for the Lama’s teaching and generosity And $30/person for the translation of the text, supplementary writings and empowerment texts. * Available as: Vast as The Heavens and Deep as the Sea, verses in praise of bodhicitta. Khunu Rinpoche, Wisdom. Boston. We suggest participants to purchase this book for attending the sessions and future meditation.